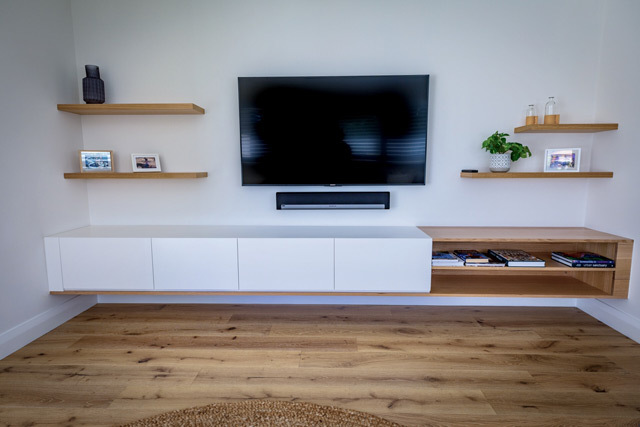 As a bespoke, Perth local manufacturer of furniture, we offer the best in feature living wall TV Entertainment units for any area of the home. Designed as a statement piece and a space saving solution, the initial steps to buying such a investment can seem daunting and confusing on where to start? So today, we wanted to give you an idea on how to approach our design process with confidence. The first step is to do your homework. If you are anything like us we ‘Google’ or ‘Pinterest’ everything! And dont forget www.lifestylefurniturewa.com.au to get a better understanding of our products. But you’re not limited to these sites. Think about magazines or local brochures? Find images that suit your particular style. Also take note of the colours you like. Remember this can be anywhere from timber to stains or painted finishes. Also take note of your room measurements ie; GPO points, skirting boards and anything else that may effect the wall cabinetry installation. Or if you live upstairs or is access difficult? We will need all this information for the design process. Now you have all the info in hand, the best way to handle this would be to come into store. This way we can clarify exactly want you are looking for as we built 100% custom furniture for you. We can talk through your images (and or drawings) With our interior design/decorating experience we can look at how we can customise this to your space (with your measurements) if needed. We will do a few sketches and guide you through our extensive range of timber, stains and colour options. Once this is all achieved we can quote you a price. This will include your delivery and installation. We hope this gives you a better understanding of our design process and we look forward to seeing you in store! Osborne Park & O'Connor.